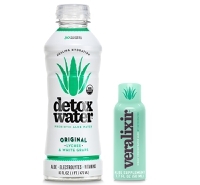 28 Sep 2018 --- Detoxwater, the prebiotic aloe-infused water brand, has launched an aloe supplement shot, coined Veralixir, which contains 1.7 fluid ounces of highly-concentrated aloe vera extract. Detoxwater recommends taking Veralixir once per day before or after a meal to promote digestive health, skin elasticity, nutrient absorption and immune health. The supplement contains clinically-proven ACTIValoe and is touted as being vegan, gluten-free and dairy-free. “Today’s consumers demand transparency in product ingredients and are looking for clean, better-for-you offerings with functionality. Improving gut health has been of increasing importance in many of our consumers’ lives, which aloe vera certainly caters to,” Kenneth Park, Founder and CEO of Detoxwater tells NutritionInsight. Click to EnlargeThis is the brand’s first line extension, following the launch of its sixth SKU, Cryptokiwi, earlier this year. “Creating a pure aloe shot that could exist on its own has been a dream ever since we launched Detoxwater, and I’m so proud of the final product. We were able to develop a potent formula equivalent to drinking three bottles of Detoxwater, all with zero calories, zero sugar and the highest quality aloe. We’re thrilled to be the first to market a nutrient dense aloe shot,” comments Park. “This new product line reflects the brand’s evolution and will further help us continue our mission to share the clinically proven health benefits of aloe vera with everyone,” he adds. Innova Market Insights notes that consumers view flavored or fortified water as a way to boost nutrient intake. Beyond fortification, like vitamin waters, the category is expanding to include plant-based waters that consumers believe may have health benefits outside just hydration. Plant-based waters are one of the smallest sub-categories in soft drinks regarding launch activity, with around 2.8 percent of the total, but this is up dramatically from 1.1 percent in 2012, Innova Market Insight data shows, demonstrating the potential for this small subcategory of soft-drinks. Veralixir by Detoxwater will be available exclusively on the brand’s e-commerce retail platforms, including the Detoxwater website and Amazon, for the first ninety days prior to launching in retailers. Detoxwater will support the launch efforts of Veralixir by hosting a Wellness Summit this fall in the Greater Los Angeles area. From there, the brand will continue to push Veralixir out through sampling, influencer programs, social and digital marketing, and event sponsorships in key markets in the US.